Motilal Oswal Securities Ltd (MOSL) was incorporated back in the year 1987 and is one of the oldest stockbroking firms in India. It is one of the leading full-service stockbrokers in India and is known for its trading applications, portfolio management services and quick customer support. 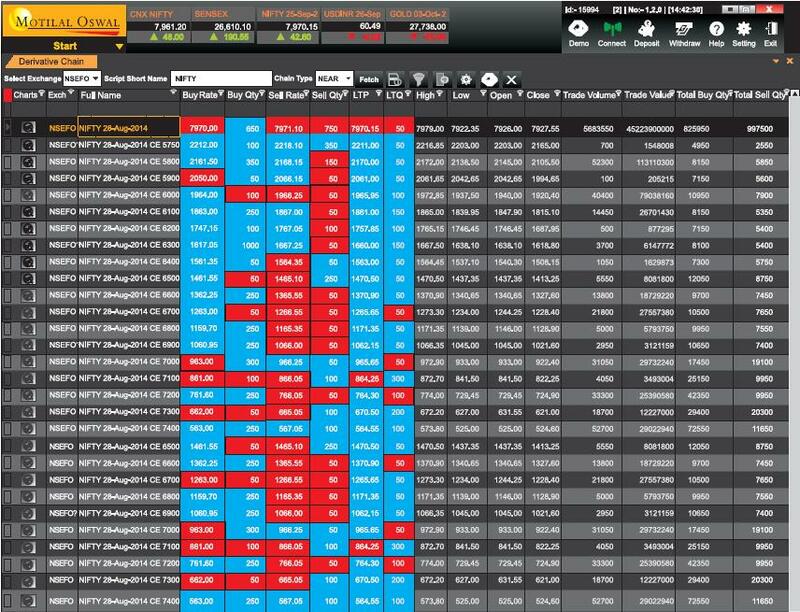 Let’s have a detailed look at the different values it provides to its respective clients and see whether this broker is relevant for you or not. 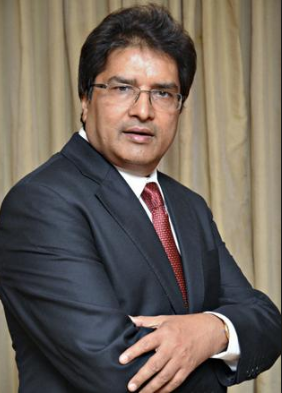 Motilal Oswal has seen organic as well as inorganic growth in the years of its existence. In 2006, it acquired a south Indian brokerage firm – Peninsular Capital Markets while in 2010, it started dealing with mutual funds after getting approval from SEBI (Securities & Exchange Board of India). Today, the group has a presence in 2200 locations through its sub-broker and franchise network to go along with around 1 million customers. 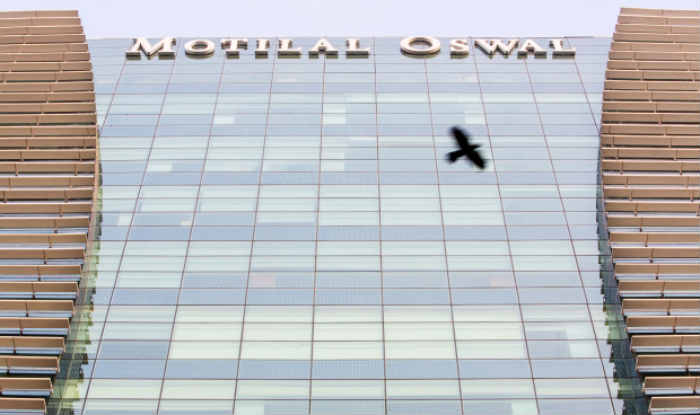 Motilal Oswal Securities has had its focus on institutional broking but off late it has been gradually pivoting towards full-service retail stock broking. As per the latest numbers from 2019, the broker has 3,22,121 active clients (numbers from the National Stock Exchange of India or NSE) across 2000+ different geographies of the country and outside (with its NRI services). Furthermore, as per the research strength is concerned, this full-service stockbroker has decent visibility and prominence with its team of 40+ research experts. This trading terminal is known for good speed and decent user experience but at the same time, is a little bulky as well. Thus, to attain a consistent rich trading experience, make sure your computer or laptop configuration is good enough. 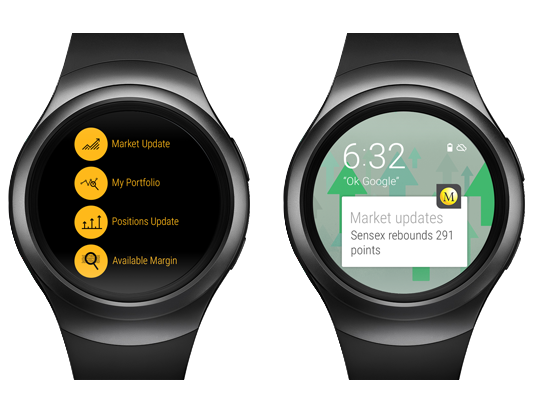 A step even further than mobile and tablets app, Motilal Oswal came up with a SmartWatch app that allows you a multitude of features. Like a watch, a trader wears this device on his or her hand and gets access to all sorts of notifications. 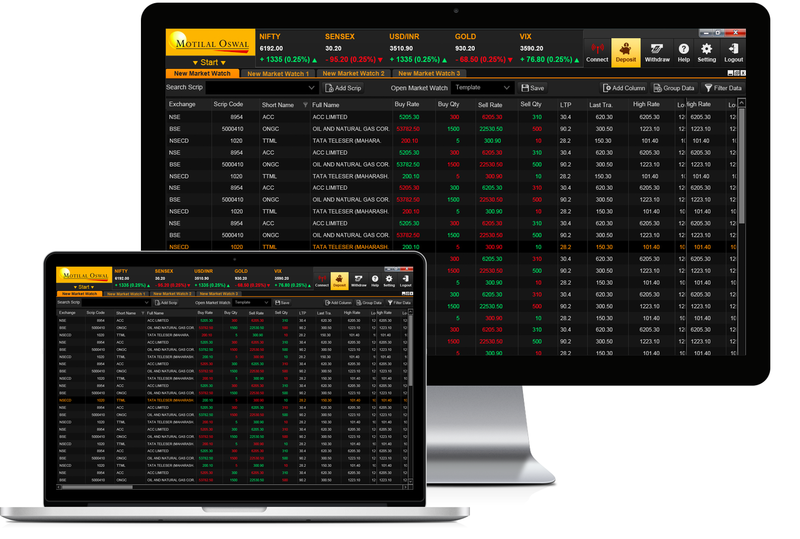 Gives a quick snapshot of the account in a single view including cash balance, positions, Order Status, portfolio performance across timelines, and Market data. Provides flexibility of selecting the Mutual Funds one wishes to purchase or option to choose from expert recommendations. 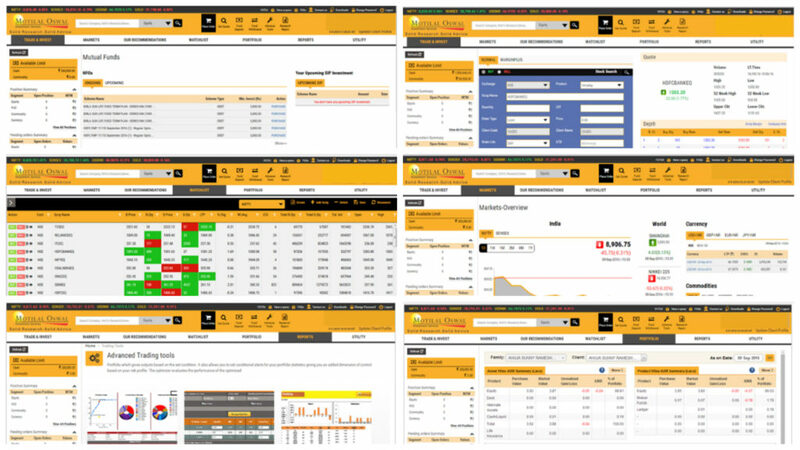 Get extensive market information like gainers/losers, most active stocks, top events, news and much more across asset classes integrated with the trading portal. The web application is not responsive in nature and in fact, it is pretty tough to use this application on any mobile device. With multiple communication channels, the broker offers a reasonable quality of customer service. The turnaround time is pretty reasonable too, however, the messaging can be improved in terms of personalized communication to clients, generally done through Email or SMS. Assistance provided through online media or telephone is pretty quick and thus, takes away the importance of offline locations. These reports talk about the fundamentals of different companies listed on different exchanges of India. Furthermore, these reports also have mentions of various economic events happening at the state and country levels that can directly or indirectly impact specific sectors and respective company stocks. It makes sense to keep a passive check on such reports on a regular basis. As the name suggests, these types of reports talk at length about different sectors, what is happening in these sectors, different government policies, market dynamics etc. Reading these reports may help you to understand what stocks may get impacted in the short as well as in the long-term at both fundamental and technical levels. Themantic reports are theme-based research-outputs coming from some of the latest events across industries and business domains. For example, if ‘Swachh Bharat Abhiyaan’ was introduced, these reports mentioned the different sectors that will get impacted positively or negatively due to such an initiative. Furthermore, there is a discussion on the different companies as well that would get the maximum impact. These reports encompass multiple types of reports that get published on a daily basis. Such reports include (but not limited to) Market round-up, currency report etc. 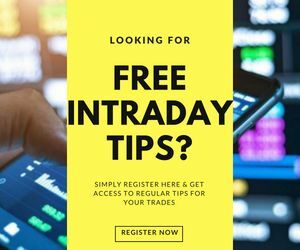 People looking to place intra-day trades may find these reports helpful since these can prepare the trader towards trading decisions to be taken in the day. Strong risk management process in place. The broker claims to serve an AUM (Assets under management) in the range of ₹10,000 Crore+ with monthly performance reports shared with the clients. Furthermore, Motilal Oswal offers PMS through its ‘Value Strategy’ that has been used by the asset management team for more than 14 years now. There are multiple types of charges that you, as a client, as supposed to pay. This includes Account opening, maintenance charges, brokerage, transaction charges, stamp duty, taxes etc. Call and Trade Platform is suitable when traders or investors don’t have online access. All its clients enjoy Call and Trade services at no additional cost. This is also known as offline trading and is suitable for clients who either don’t prefer trading online or don’t know how to trade online. To Open an account with Motilal Oswal, You need to pay a minimum of ₹25,000 as an initial deposit into your trading account balance. Thus, looking at the pricing, it is certainly one of the expensive stock brokers in India. There are a couple of plans Motilal Oswal offers to its customers. Depending on the plan you choose, the brokerage charges differ. The Value Pac is a subscription-based plan where you need to pay a certain upfront amount based on which the corresponding brokerage charges are applied. The payment made in this plan is NON-Refundable. “In the case of full-service stockbrokers, the brokerage is percentage based. This implies if Motilal Oswal charges you 0.3% for delivery trades and your trading capital is ₹1,00,000 then the brokerage for that particular trade is ₹300. Similarly, the Margin account plan requires you to provide a margin amount, which is refundable, in nature before you start trading. Use this Motilal Oswal Brokerage Calculator for complete charges and your profit. 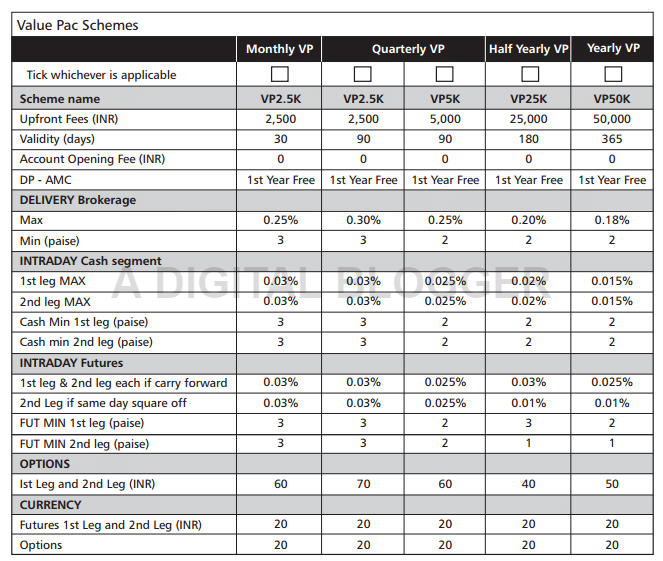 Value Pac is an upfront subscription scheme, which provides reasonable discounts on brokerage rates with a defined time period to use it. With the wide range of Value Pacs, based on the Volume of Trade and the Validity period one can enjoy the benefits of placing trades at reduced charges. Watch Video for detailed understanding. To understand this in detail, let’s take an example. For instance, if you pay ₹2,500 for 1-month, then you will just be paying 0.25% as a brokerage charge based on your trade value. Similarly, the brokerage percentage drops to 0.18% in case you opt for ₹50,000 for a 1-year plan. Thus, it really depends on your trading preferences, capital and trading pattern. In the Margin Account, a customer needs to provide a defined upfront margin amount at the time of opening the account. 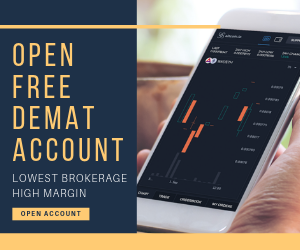 When you use the Margin account, the brokerage percentage is decided based on your initial deposit. The more the deposit, the less you end up paying as brokerage percentage. This kind of plan is pretty conventional in nature and is available with most of the full-service stock brokers. At the same time, you must certainly negotiate with the executive of the full-service stockbroker. We have seen many instances where clients have saved decent brokerage percentages just by negotiating before opening the account. In order to use PMS services, you need to start with an initial deposit of at least ₹25 Lakh. You may choose to further increase your fund value by a top-up of ₹50,000 minimum. At the same time, you may use your stock holdings from your demat account as well in order to use PMS. Again, the total valuation of these holdings must be in the range of ₹25 Lakh. Make sure to get everything documented or emailed before you open an account with Motilal Oswal. This includes the final brokerage charges/percentage that you will pay across segments and other related charges. Make sure you understand some of the hidden charges, that you might not be explained at the onset. A wide range of trading products offered for different kinds of requirements you may have. Quick customer support and assistance. One of the best portfolio management service provider in the country among all the top stockbrokers. One of the oldest names in the industry, so the trust factor is there. “Well, Motilal Oswal is a stockbroker for traders and investors. So whether you are looking to make short-term profits or long-term investments, it can certainly be one of your probable options in terms of research. However, it needs to come clear in its Pricing. The brokerage plans can be misleading and there have been cases reported around some hidden charges at a time. Thus, a little caution from the customer’s point of view is suggested. Enter Your details here to get a callback. What are the account opening charges at Motilal Oswal? 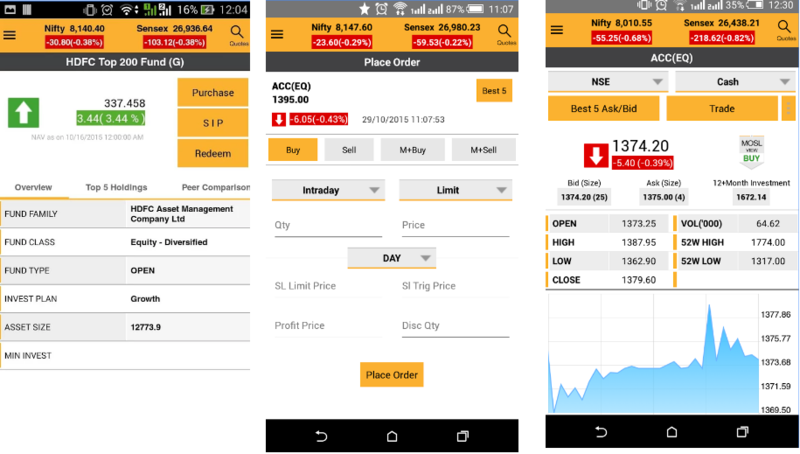 To open an account with this full-service stockbroker, you are required to pay ₹1000 for the trading account, while the demat account has no cost attached to it. What is the research quality at Motilal Oswal? 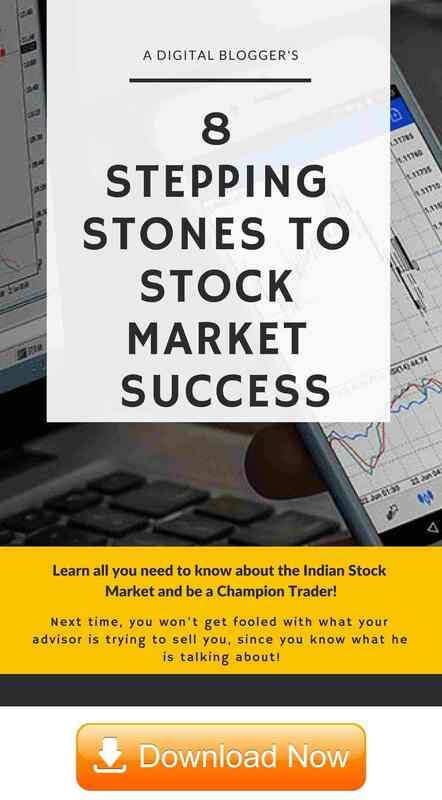 The full-service stockbroker provides you decent research reports, recommendations and trading calls through Email, SMS, Whatsapp to go along with the research section within the trading platforms offered by the broker. It becomes much easier to make quick judgements by accessing the reports in the platform. As far as accuracy is concerned, the broker provides better than Industry average quality to its clients. Does Motilal Oswal allow me to invest in Mutual funds and IPOs? Yes, the broker offers multiple trading and investment products including Mutual funds and IPO investments as well. How many clients does Motilal Oswal has and how many of those are active ones? As of June 2017, the full-service stockbroker has a client base of over 9,000,000 with 2,07,194 active clients. What is Motilal Oswal Uppermost? This is a mobile app by the full-service stockbroker offered to its partners, sub-brokers and franchises where the users can get access to its own client data, the corresponding brokerage generated and other details specific to the partner’s business. How much is Motilal Oswal AMC (Annual Maintenance Charges)? To maintain your Demat account with the full-service stockbroker, you are required to pay ₹400 on a yearly basis. Trading account AMC or annual maintenance charges are nil. 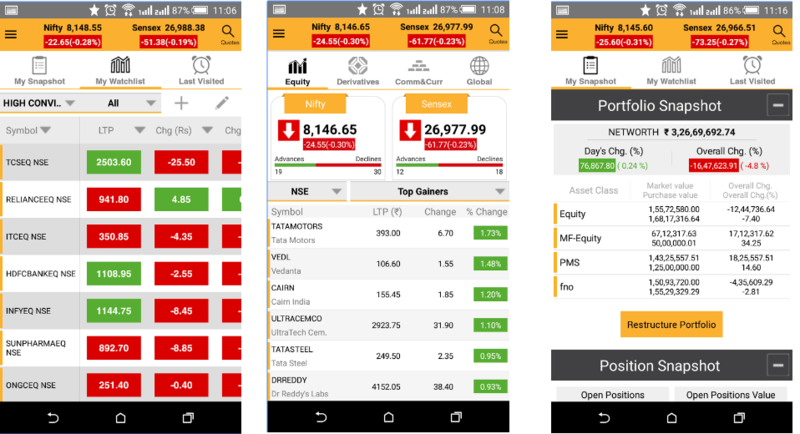 How is Motilal Oswal’s mobile app? 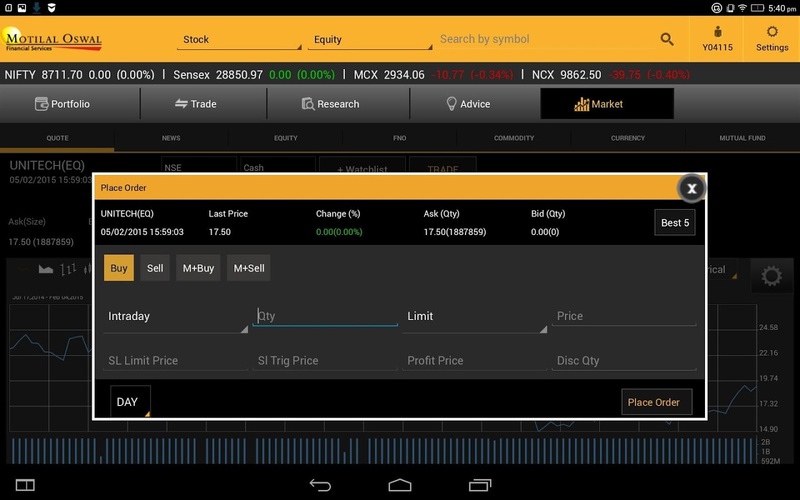 Although the full-service stock broker offers multiple trading platforms to its clients across devices. As far as the mobile app is concerned, it is good to use as far as performance and user experience are concerned. However, there are few issues related to the number of features or usability of the application. As of now, it is certainly a recommended application for you to use for trading. Can I place AMO (After Market Hour Orders) with the broker? Yes, you can place aftermarket orders i.e. order placing is allowed even after the market is closed. Which broker do provide the best recommendations? Motilal Oswal Research calls are very poor, it is coming around 20-30%. so it is better that open trading account from any discount broker and buy research calls from sebi research analyst.